Yesterday I was watching TV and saw a commercial with music by Queen in the background. Wow, I've listened to Queen a lot a couple years ago, say, 10 years ago, I listened to it a lot, to the point where I couldnt appreciate it anymore. But now, I got some of their CDs and have been listening to it all day, its just incredible the capacity of those musicians, specially Freddie Mercury, he hits every note perfectly and transmits how much fun they had recording their music. I feel like every song is a classic. Im enjoying it again and it feels great, I cant put to words how much I love music, how it fills every little vein in my body with pride of the human capacity to create an emotion triggering composition so rich as that, imagination mixes with emotion and explodes, and Im not just talking about Queen, Im talking of the whole range of musicians from Beethoven to Radiohead. 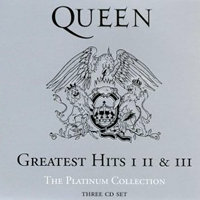 If you liked Queen you have to "get", (yeah "get" with both hands raised with two fingers doing the hook) their platinum edition CDs, I guarantee it will make you laugh, revive memories and fill you up with musical completeness. Of course only do it with a good sound system, the difference between a little CD player and a gooood sound system is like the difference between a banana and my itching left ear, it changes everything. If you do listen to them, please comment on how you experienced listening to them again (Im sure you havent listened to them in a while). 1. Kick off your shoes and walk around on your feet for a while, get relaxed. I have to laugh. I can tell you are getting old(er). How? crank the volume up with your remote to a nice loud but not heart attack level. It's what comes after the 'but' that gives you away. Whoa! I read your blog hours ago and didn't even realize that it was unnatural for you to blog. Rock on! I was reading your blog (nice look, by the way! I love the two stripe effect! ), and thought, "Oh, yeah! I loved Queen!" So I dutifully trudged all the way over to the iTunes store, resisted the temptation to buy the $50.49 Platinum Collection, bought It's a Hard Life off of The Works, chose Living Room in the lower right corner of iTunes and it's playing right now on the stereo. You are right. These guys could sing.